Why have one retro Toyah interview from 1981 when you can have a quadruple? Click below to listen online or download My Top 12, The Annie Nightingale Show and Talkabout – all from BBC Radio One, plus an interview from BFBS Radio from December of that great year. 1. Radio One: My Top 12 (Nov 1981): Toyah chooses her favourite songs and talks about her life, music, hobbies, childhood, fans, career… 2. Radio One: The Annie Nightingale Show (Aug 1981): Toyah talks to Annie about her life, 1981 and new single. 3. BFBS Radio: (Dec 1981): Toyah interviewed in Europe at the end of her successful 1981. She talks about the year, her future plans, Christmas and the band’s new EP ‘Four More From Toyah’. 4. Radio One: Talkabout (Feb 1981): A Valentine’s Day special. A couple of retro Toyah radio appearances: The New Recruit, from BBC Radio Four (April 1994), and an interview with Toyah (and Sting) from The Annie Nightingale Show, which aired on BBC Radio One (January 1984). Click on each below to listen or download. 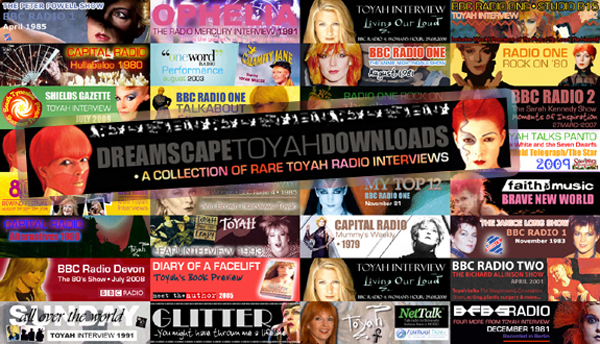 Four rare radio interviews with Toyah; 1979 – 1982. Click below for the Downloads section. 1. Capital Radio: Mummy’s Weekly (1979): Fighting talk from Toyah! She also chats about being discovered, ‘Victims Of The Riddle’ and more. 2. Radio One: Rock On (1980): Toyah talks Shoestring, Glitter, the band’s influences, mayhem, ’Sheep Farming In Barnet’, ‘Neon Womb’, and future plans. 3. Radio Trent: (January 1981): Toyah, interviewed just before the release of the ‘Four From Toyah’ EP. Great interview with lots of interesting pre-mainstream fame chat. 4. Radio One: Rock On (May 1982): Toyah talks to, former ‘Smash Hits’ writer and eternal cynic, Mark Ellen about ‘The Changeling’, aliens, fairies, her ‘Brave New World’ image and much more. • Thanks to Giddy Gavin (aka Logan 5) and Sean. All four episodes - 1. Away To Neverland, 2. In The Mermaid’s Lagoon, 3. An Awfully Big Adventure. 4. Spring Cleaning Time Again - of JM Barrie - Peter Pan, which aired this week on BBC Radio 4 Extra, are now available to listen to at your leisure at BBC iPlayer – for the next month. Click on the cast photos below (Thanks to Official Toyah) to browse the iplayer list. There’s a great page at Focus On The Family on the Radio Theatre production of Les Misérables. 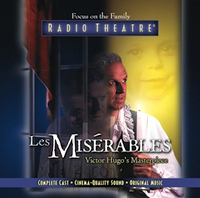 Toyah plays Fantine in the 2007 full-cast audio drama which is available to buy on CD or download. A Radio Theatre Classic: It’s one of the world’s masterpieces of storytelling. Against the stirring background of the French Revolution, follow the tale of Jean Valjean as he encounters the savage injustice of the law — and then the gentleness and grace of God. It depicts events like the battle at the barricade and a heroic rescue through the underworld of Paris. Toyah Willcox as Fantine: Toyah co-starred with Sir Laurence Olivier in the acclaimed British TV production Ebony Tower. Her film roles include Miranda in The Tempest, Jubilee,Quadrophenia and The Corn is Green with Katharine Hepburn. A short excerpt from Toyah’s autobiography, published in August 2000, ‘Living Out Loud’. Toyah talks about ‘The Changeling’, and some of the events of 1982: Winning ‘Best Female Singer’ at The British Rock & Pop Awards, sacking her manager, feeling that her images and hairstyles were becoming outdated etc. Toyah also mentions the reasons why herself and Joel decided to record an album with much darker themes after the huge success of ‘Anthem’ the year before. • Listen to ’The Changeling’ set of Toyah interviews and audio, at ‘Soundcloud’, here. Six days to go… Another audio interview that’s been available at Dreamscape and The Changeling 30 sites but good to have it here too in this countdown week to the launch of ’The Changeling Resurrection’ tour. This is the only audio that exists from 1982 with Toyah discussing ‘The Changeling’ in any detail. Toyah guests on Rock On on ‘BBC Radio 1′, talking to Mark Ellen about the album, aliens, fairies, changelings, critics, the ‘Brave New World’ image and much more. Mark Ellen sounds quite bemused but it’s fair to say that in 1982 he would probably have been far happier interviewing Bruce Springsteen or REO Speedwagon. • There’s also a full transcript of this interview, at ‘The TW Interview Archive’, here. 2012 marks 10 years since Toyah took on the lead role of Calamity Jane, the musical that toured the UK and also enjoyed a residency at the Shaftesbury Theatre in London’s West End. The, highly successful, production ran for over a year and, ultimately, played to more than 200,000 people through the UK, receiving numerous positive reviews along the way. Toyah was great in the musical, and really took on the role of ‘Calamity’, giving an incredibly physical performance, but there were also tender moments. The pivotal scene, and song, of the show was ‘Secret Love’. The song is legendary and forever associated, just like Calamity Jane, to Doris Day. As you’ll hear below Toyah sang the song beautifully and her voice soars. One you may have missed, or might just want to listen to again: Chris Limb’s interview with Toyah from 1987. Listen here. There’s also a full transcript of the interview, at ‘The Toyah Willcox Interview Archive’, here.